Borneo is one heck of an incredible and mysterious country, where things go bump in the night and it’s usually a creature that is both exotic and rare. Craggy mountains, rainforests drenched in mist, winding wide rivers and relaxing times await for you there. 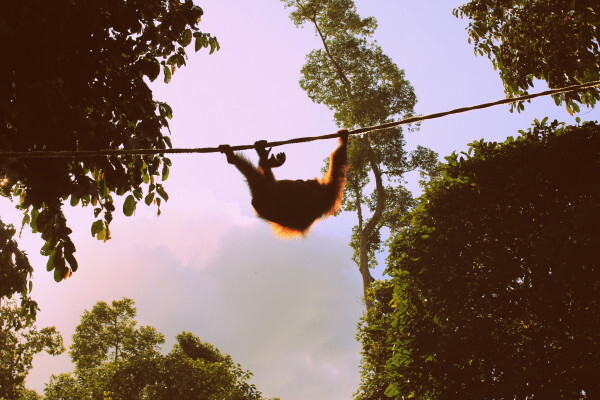 Malaysia’s Borneo is a destination on many people’s bucket list for a reason, as it’s natural beauty will blow your bloomin’ mind and you’ll find yourself falling hard for those cute orange monkeys called Orangutans. 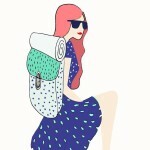 I began this post as a ‘10 Reasons to…’ but it quickly became apparent that if you had to read through my full list in one go, you would probably age about 2 years. 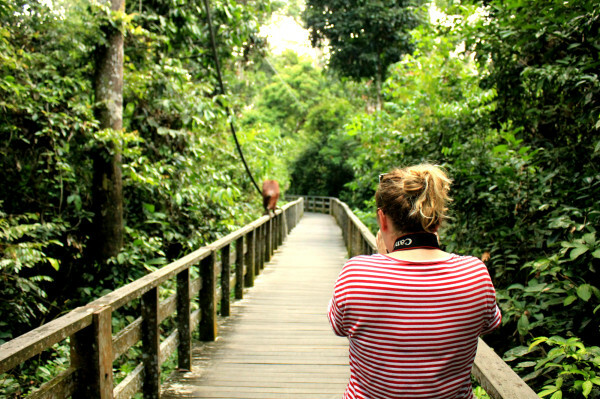 I’ve broken it down into two posts, and this is the first half of my 10 Reasons to explore Borneo, which focuses on wildlife and the jungle. Fly from Kuala Lumpur on the western peninsular of Malaysia over to Kota Kinabalu, which is the capital of the state of Sabah which is nestled in the northern tip. 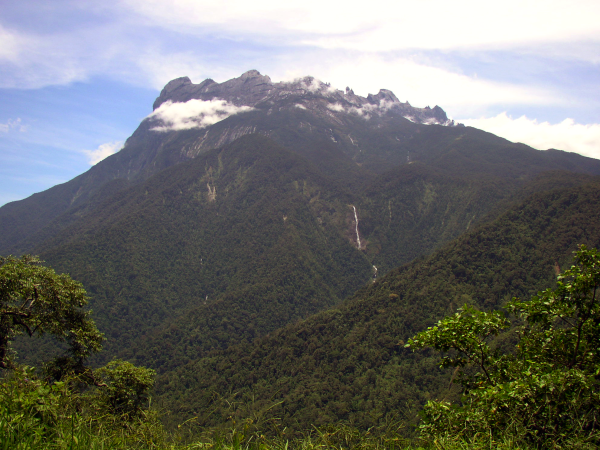 It’s the gateway to Borneo and makes a great starting point in your exploration of Borneo a.k.a. Malaysia’s eastern peninsular. You can go overland or by a super quick flight over to the east side, which has Sandakan and Sepilok’s world famous Orangutan centre. It was the closest I’ve got to experiencing life a la Mowgli from The Jungle Book, despite not encountering a tiger (thank Jesus). Have a sneaky peruse at what I found to be it’s most glorious features and it will hopefully have you book a ticket over there quickly in case it’s beauty fades away from human destruction. 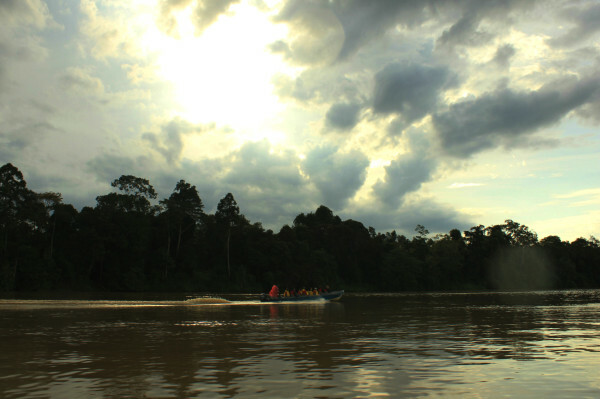 OK, I’ll start with an important feature of Borneo which many associate with the country. 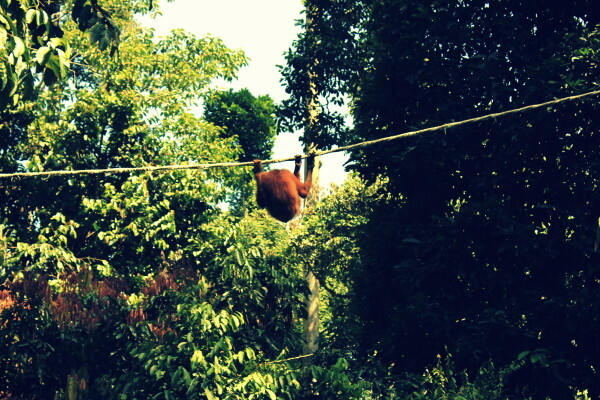 And that of course, is the Orangutans. Those cute, fuzzy, orange darlings are what everyone wants to hold and cuddle when they head this way (I would’ve loved to be able to do that), but the most honourable way to see them is when they’re semi-rehabilitated and nearly integrated back into the wild. 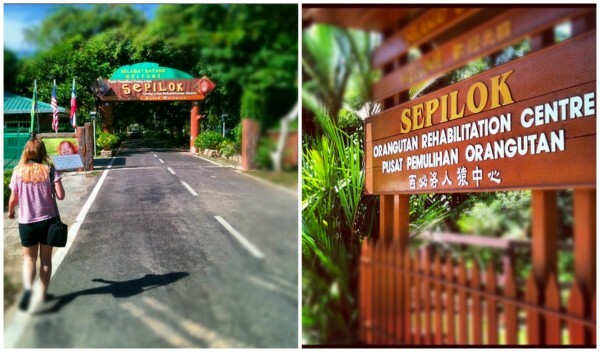 The Sepilok Rehabilitation Centre lies in Sepilok, a mere half hour taxi ride from Sandakan’s airport.The centre was set up in the 1960’s to help orphaned orangutans get back to the wild and is set on the edge of the protected Kabili Sepilok Forest Reserve. Along with other animals, such as sun bears and the occasional elephant, they are nursed to full strength and then released into the reserve. The Malaysian government has clamped down on illegal trading and poaching of Orangutans and have taken these measures to try and resurrect the sparse population. Feeding times are like clockwork: a 10am feed and a 3pm feed. 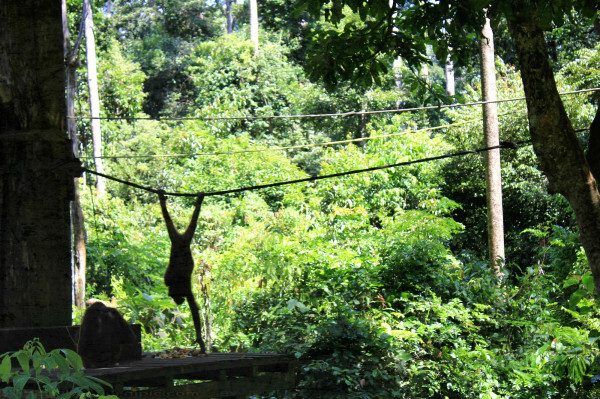 As the monkeys are pretty darn clever, they’ll make their way over to the feeding platform that is visible from a walkway to lazily take bananas from the workers. It’s lovely to see them emerge from the trees one after another to get their feed, but the less Orangutans you see the better. If they don’t return to the platform, it means they have the confidence and the skill to make it on their own out in the jungle. To try and encourage their independent foraging, they make the food as monotonous, yet nutritious, as possible. The crowds are quite large to see these special creatures so get down there early! 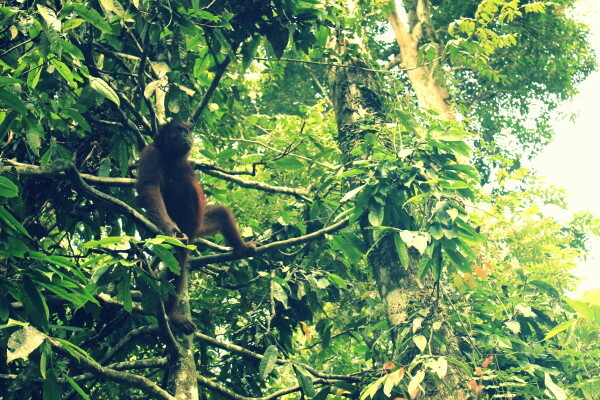 On our second visit, we were running a bit late and ran into a giant Orangutan who was equally as late to the feeding. He dropped straight out of the trees into our path and a few of us followed him with fingers pointing and mouths gaping, astounded that we were so close. I doubt he was very impressed. 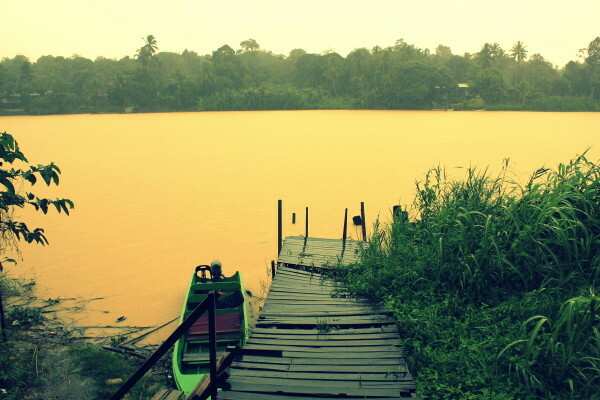 In Sandakan, the River Kinabatangan snakes from the southwest mountains to the Sulu Sea. 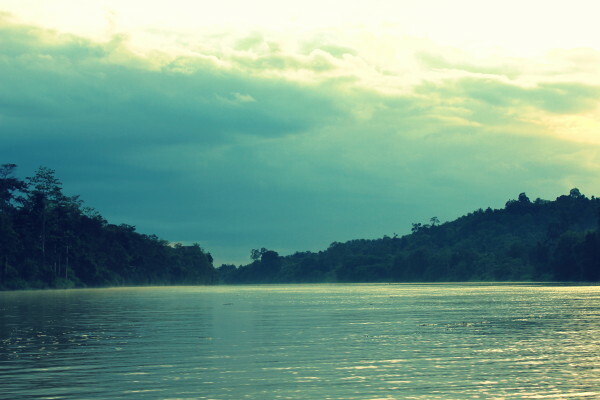 It’s the second longest river in Malaysia and is well-known for it’s bustling wildlife. 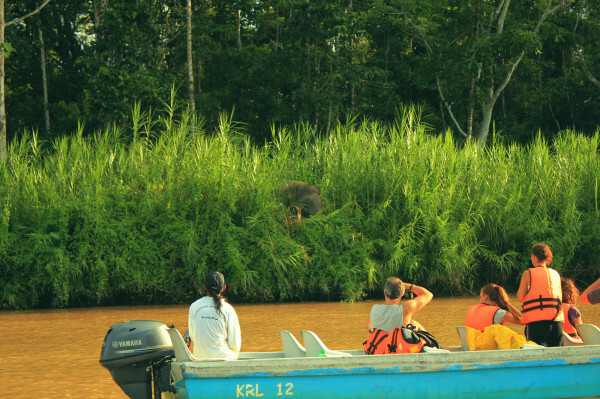 Whilst the boat ride will see you picking out gibbons, rare birds, proboscis monkeys, rhino and other creatures, the reason as to why they are all so visible is quite sad. 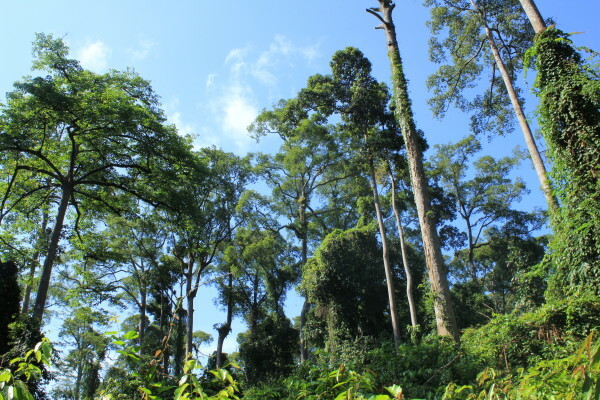 The high concentration of wildlife is because of the excessive amount of logging that has taken place further inland. The land clearance for plantations has driven the animals closer to the river banks for sanctuary, so for tourists it’s easy sightseeing, but for ecology it’s a situation teetering on disaster. 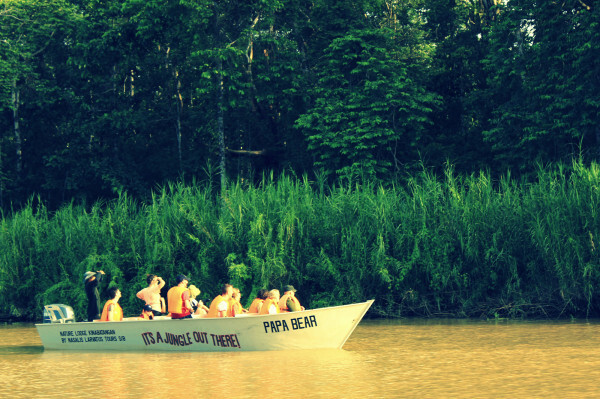 Heavy environmental issues aside, a boat ride is a fantastic way to see some of Borneo’s nature in peace. You’ll find yourself the only boat on the water with wide expanses of water surrounding you and quiet animal sounds echoing in the distance. I would recommend a boat company to go with, but unfortunately the one we booked with completely forgot to pick us up. We ended up frantically getting our hostel owners to negotiate a way for us to get on the river with the locals, and they came up trumps! We managed to get a taxi to the river and a boat ride for the same price as the tour (minus an hour of rambling), and it was just the two of us on the boat. That did make it a bit more special to us, but we were generally pretty relieved to get on any boat to see the river in all its glory. “Pigmy Elephants?” I hear you cry? Well, I had never heard of them before and to be honest I thought they were going to be some kind of dwarf elephant that would be running amok at waist height. Adorable elephants that you could pop in your suitcase and take home?! Alas, no. Despite being of the Pygmy variety, they are sizable elephants that are still a sight to behold. Especially, if like me you’ve never seen an elephant in the wild, it really will be something jaw dropping. 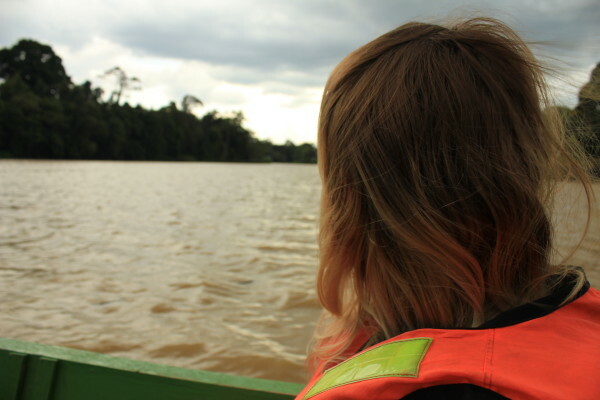 Whilst on the River Kinabatangan, our boat drivers began quietly chattering in Malaysian. 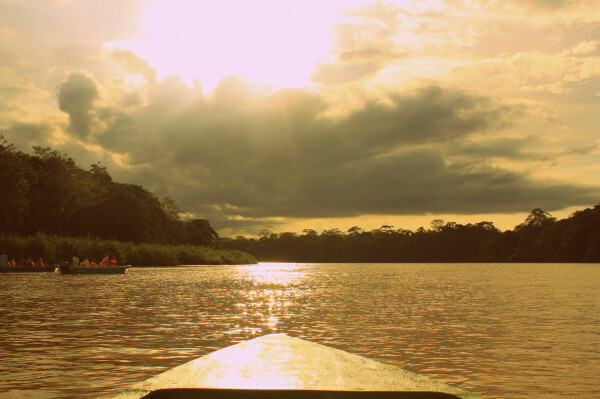 They began zipping their boat down the river and looking curiously around until we found ourselves with two other boats, heavy with silence near a thicket of tall riverside grass. And then we heard the snuffling of a beast. This ‘small’ elephant, which was really quite adorable, emerged from the grass stuffing it’s mouth with delicious vegetarian delights. 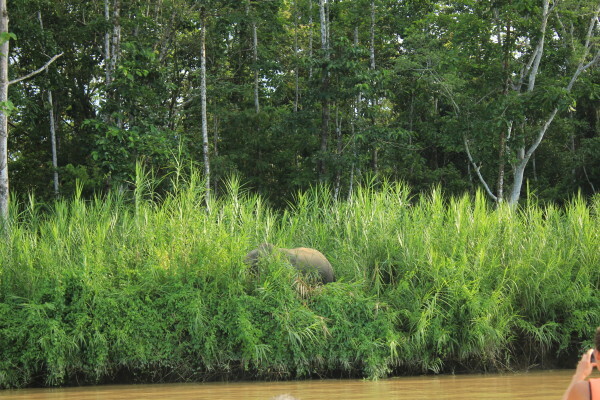 The Borneo Pygmy Elephant is a listed endangered animal that is threatened by their increasing loss of habitat, like a lot of the other wildlife surrounding the River. They are usually found feeding by the river in north-east Borneo, so to witness these little guys in this unobtrusive style is a must. And those boat drivers are well-tuned to when and where these elephants will pop up for their lunch. 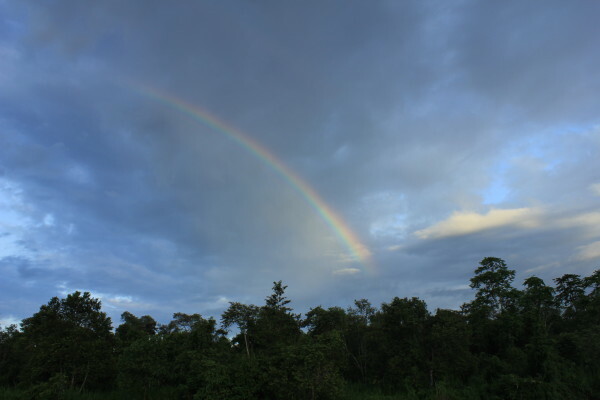 So as you may have guessed, since Borneo is stocked full of rainforest, it is a humid country that is thick with moist air. It makes you sweat when you stay stock-still and your hair slicks to the back of your neck like a mildew towel. Temperatures can reach 32°C, but even if it isn’t that scorching the humid factor makes it feel so much hotter. But you know, you just got to wrap a headscarf around your head to mop up that sweat, strike out and catch all that Borneo has to offer. 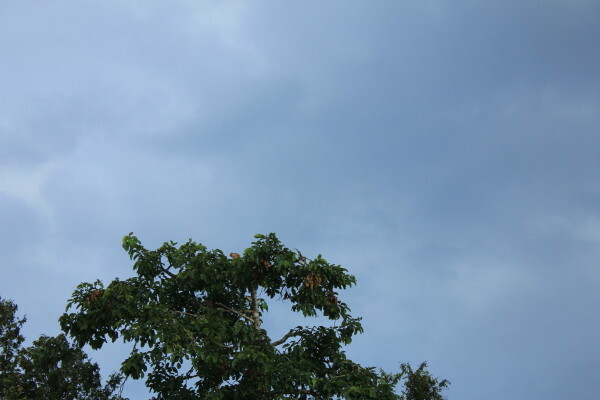 But as tropical climates go, the weather can turn in an instant. Although we were there in February which is one of the drier months, freak rainstorms can break out without a moments notice causing everything to stop in muffled, thick silence. 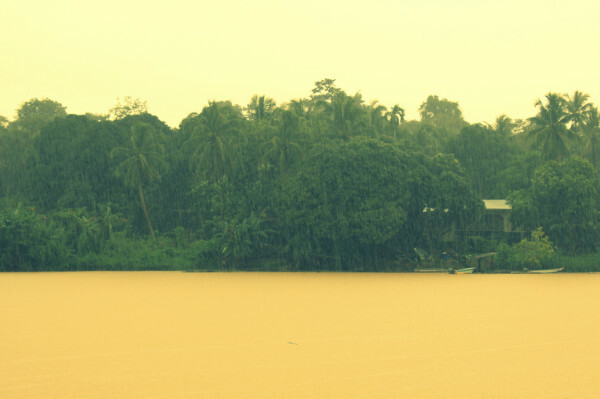 We happened to be on the river when that happened and the sheer amount of water pouring from the sky was phenomenal, until we realised that it was going to fill our boat and sink us. Cue us pulling up at a random bank and sheltering with lovely locals. Our delightful boat drivers had given us waterproof ponchos (they weren’t going to save the boat though!) so I would highly recommend bringing some along when visiting Borneo. You won’t need any warm jackets, unless you head up the mountains, but a poncho is definitely a good idea for when nature decides to piss down on you. When visiting Sepilok, it is a great idea to sleep nearby the Orangutan Centre so you can get up early and catch those morning feeds. It’s slim pickings in these parts as tourists drop in for a Orangutan-filled day trip, but luckily we scored some beds in a pretty awesome place. 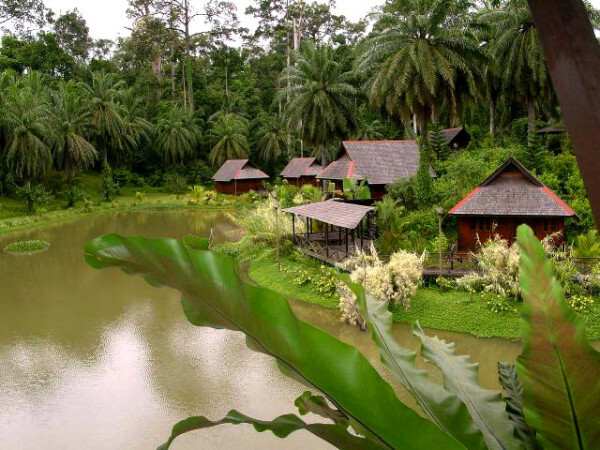 Sepilok Jungle Resort is a large sprawling accommodation that embraces the jungle and weaves around the natural landscape. 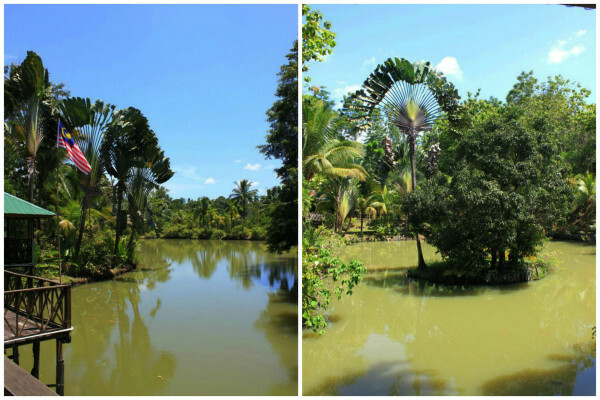 You’ll find yourself walking over bridges and high walkways that take you over green ponds. The Resort also has a pretty refreshing pool too, which provides a welcome relief from the midday heat. You’ll dine in the on-site restaurant besides mirror-like pools of water with the sound of chirping insects as your background music. Wooden structures are dotted across the site containing everything you need, from cafes to a sauna, and there’s plenty of spots to hang out. It definitely helps that there is WIFI available at the cafe too, which is a bit surreal when you email friends from what feels like a well-accommodated jungle. 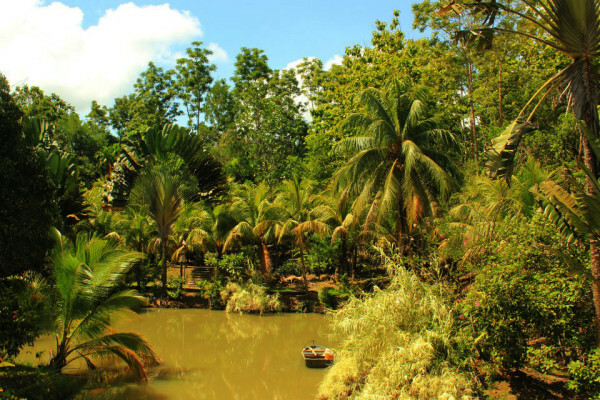 It’s a quick 10 – 15 min walk to the Orangutan centre, so that alone makes it a great place to stay! 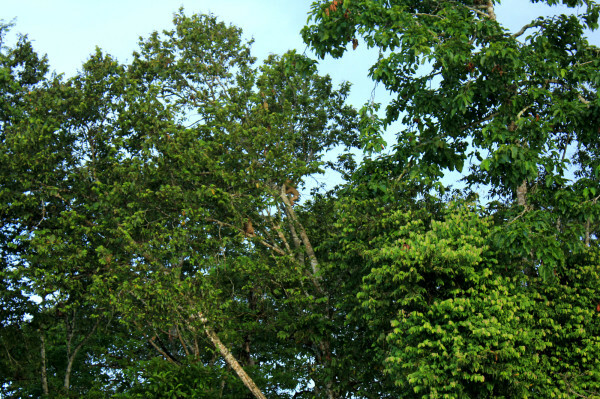 You can use it as your base to explore the centre, venture to the River Kinabatangan and also the Sandakan Rainforest Discovery Centre, which has a pretty good canopy walk up in the trees. 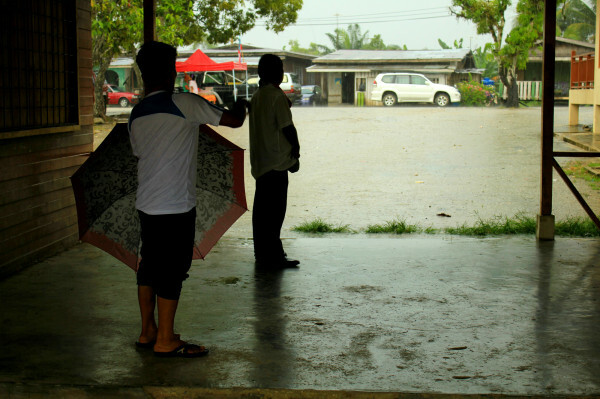 As you can see, Borneo is damn exciting and everything you would expect from a wild jungle. There are a heap more reasons to head over there, and I’ll cover my next five reasons next week, which will include more beautiful sights and activities. I’m fully confident that another 20 reasons could be added to my list… but hey, that would be spoiling the surprise of Borneo! Image 25 Borneo.com.au, image 26, 27, 28 via Samantha Waite. image 29 wikimedia. All other photographs by Sophie Saint. Words can't even describe how jealous I am. I've been wanting to visit Borneo and the Orangutans for as long as I can remember, as a child I wanted to work with them, but sadly I was awful at Biology and the sciences so couldn't go on to do Zoology :( sad times. 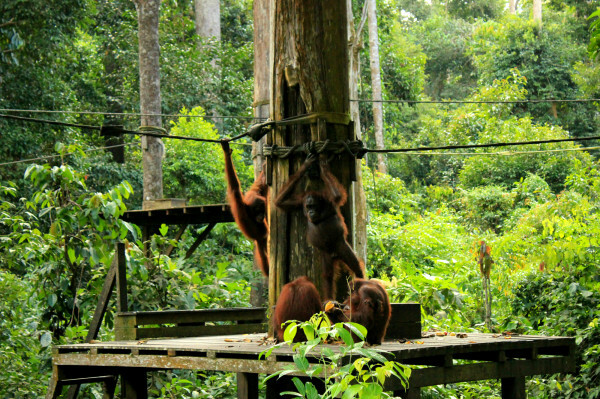 I'm keeping all my fingers crossed that next year I'll finally be able to make the trip to Borneo to see them! Borneo has never been on my bucket list... until now! Honestly, I would love to visit a real life jungle. The only thing that's always put me off is the thought of tarantulas / giant spiders. 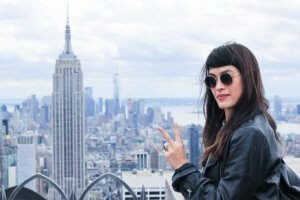 But I can't let my fear of them stop me from doing the things I want to do, so I guess I'll just have to bite the bullet and go! 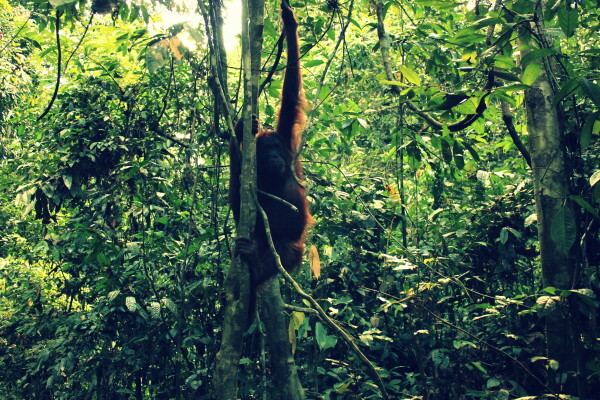 Would love to see orangutans, too - amazing that you saw one so close. Wow! Great article and the pics are incredible! I've been travelling extensively for about 15 years and reading an article about Borneo years ago was what started it all. Still haven't been but crossing my fingers for next summer. Thank you for sharing! i think you've mispelt Malaysia in your title. Have you been to Sarawak?